The most exhilarating part of riding a motorcycle is taking it through the twisties. But it’s not very exhilarating if you have a death grip on the bars, your body is frozen rigid, your legs are numb from clinching the tank for dear life, and you’re taking the corners 20 MPH (32 KPH) below the speed limit all while trying not to hyperventilate. OK, so I may be exaggerating a little bit. But the twisties aren’t nearly as much fun if you’re not confident in your cornering abilities. I’m not too proud to admit there are times when I’ve experienced all of the above — except my legs going numb — when I first started riding. I’m still fairly new at it, with just one season and about 3,500 miles (5,600 km) of seat time, and my confidence in the corners isn’t near where it should be. Sometimes I still find myself holding my breath or gripping the bars too tightly when I feel I’m going in too fast. When I started riding I would have never imagined there would be training materials dedicated specifically on cornering techniques, but now I realize why there are. With an understanding of motorcycle dynamics and how to enter, proceed through, and exit a corner, riders can be safer both on the track and on the streets. 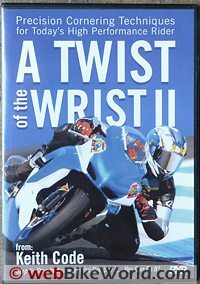 The “A Twist of the Wrist II” DVD by Keith Code is an excellent video for teaching those proper cornering techniques I was missing before. As luck would have it, I found the video just after I had finished reading Keith Code’s original book version of “A Twist of the Wrist II” (review). While I found the book very informative, and the pictures and illustrations of riding position, bike position, and lines through a corner were helpful, being able to see the methods in action in the video was even better. It was like flipping a switch in my mind. Everything made sense on paper, but sometimes it helps to see it. And for some, seeing is believing. A Twist of the Wrist II DVD was filmed with several camera angles — both on and off the bike — so that nothing was missed. There are even close-ups of clutch, brake, and throttle action during downshifting. The DVD follows the story of two riders trying to figure out how to ride better and faster through corners. It opens with them noticing the “chicken strips” on their tires and comparing them to others. While the acting will not be nominated for any academy awards, it is entertaining and helps the viewer relate. The opening segment of A Twist of the Wrist II reminds me of when I started riding. The riders ask for help on cornering and proceed to get several different answers on how to turn — none of which were correct and all of which are quite vague. It’s just like what happens in real life; no wonder it’s so easy to get confused! Keith Code then steps in and the instruction begins. Advice versus technology is discussed and demonstrated. The video shows a rider counter-steering and then defeats myths like “body steering” and weighting a foot peg to turn a motorcycle by showing a rider doing those things without much change in the direction of the bike. The scenes of the actors talking about what they were doing wrong and trying to figure out the next step helps to segue the video to the next section of instruction. This method moves it along smoothly and gives the viewer a few moments to process what was just taught. A couple of segments also show Keith Code teaching kids in a classroom setting. I had no idea racers started so young! When the video shows a group of ten-year-olds riding around the track, I have to admit my ego took a hit. But hey — if kids can do it, then I can too, right? So in a way, it’s also a confidence booster. It all comes down to training, knowledge, and developing the correct riding techniques. What I really appreciate about A Twist of the Wrist II are the demonstrations of the wrong way to ride or react in a given situation and how “SRs” (survival reactions or fear) — such as chopping the throttle — affect bike handling. For example, you can see the bike stand up and go wide when the rider rolls off the throttle in a corner. In the next scene, a smooth, steady roll on of the throttle demonstrates how the bike’s dynamics allow it to hold a line. These right and wrong examples are repeated in various situations, such as braking before entering a corner, when to get on the gas, setting up your turning point, turning or flicking the bike, etc. In several cases, the video shows side-by-side comparisons so the viewer can see the difference in lean angles and lines as a result of a later turn entry and other techniques. Computer-generated images are also used to demonstrate how throttle control or a too-tight grip on the the bars can affect motorcycle dynamics. By the way, this DVD isn’t just for those who ride sportbikes at track days. It is mentioned repeatedly that the techniques apply to the street as well as the track, and to cruisers as well as sportbikes. In fact, a few times during the video several different kinds of motorcycles follow each other through the turns to prove this point. There is also a bonus section on sag adjustment. This part shows how to adjust a motorcycle’s suspension to meet the rider’s preferences and riding conditions (track or street). A Twist of the Wrist II immediately helped me see what I am doing wrong when cornering and how to improve it. I highly recommend this DVD for all riders — for those just learning as well as those who have been tearing up the street or track for years. In my opinion, all riders will benefit from repeated viewings and then putting into practice the techniques Keith Code teaches. Now, if you’ll excuse me, I’m going to go watch it again before I tackle the twisties this weekend!